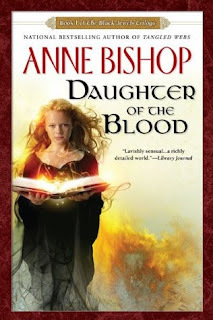 Daughter of the Blood by Anne Bishop ~ Daughter of the Blood was my first introduction to Anne Bishop's Black Jewels trilogy, and Anne Bishop's writing in general. I actually had my doubts about the book at first. I had a hard time getting a firm hold on the sense of place and time. But that soon changed as I grew closer to the characters, and became more involved with the story. I was hooked after that, and ended up reading the next two books in the trilogy soon after finishing this one. 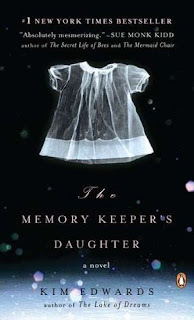 The Memory Keeper's Daughter by Kim Edwards ~ In this story about two families and a child with Down's Syndrome, each of the characters found a place in my heart. I could see the bad decisions before they were made, felt the disappointment and loss, and shared in the hope or improvement and change. 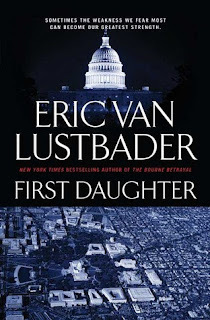 First Daughter by Eric Van Lustbader ~ A political thriller in which an ATF agent is up against the clock to find the kidnapped daughter of the new President-Elect. Corruption, faith, false leads, secrets, redemption, prejudice, and self-discovery are all components in First Daughter. Although this one got off to slow start for me, I did enjoy it. 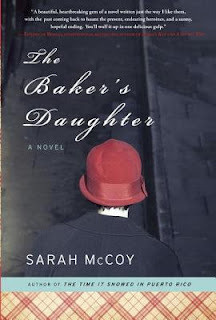 The Baker's Daughter by Sarah McCoy ~ One of my all time favorite books! This is a story about love, about family and about relationships. It’s about facing our demons—our pasts—our fears and our regrets. And about forgiveness—not only of others, but of ourselves. There wasn’t anything I did not like about The Baker’s Daughter, from the well-drawn characters to the various story lines, to the historical and present day aspects. 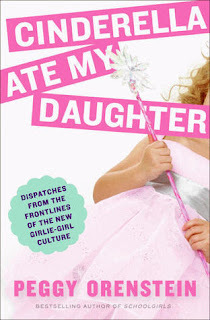 Cinderella Ate My Daughter: Dispatches from the Frontlines of the New Girlie-Girl Culture by Peggy Orenstein ~ As I read Cinderella Ate My Daughter, I felt a sense of relief in a way. Peggy Orenstein had gone through just what I'm going through. She had many of the same concerns and questions about perpetuated gender stereotypes and the media and how to maneuver in today's culture as a parent. Because of that, she decided to do a little research and what we have is her book. Cinderella Ate My Daughter is entertaining, educational, and self-affirming. It offers food for thought, to be sure. And it also made me realize I'm not alone. 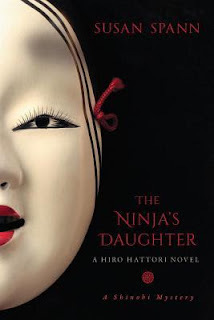 The Ninja's Daughter by Susan Spann ~ A historical mystery set in 1565 Japan, featuring a Jesuit priest and and a ninja. The Ninja's Daughter is a traditional mystery in many ways, with the protagonists asking questions and putting together the clues they find in hopes of finding out who did what. The deeper they dig, the more they uncover, including that almost everyone seems to be keeping secrets. There is some action, but it is a relatively quiet novel, with some tense moments. Even so, this is a quick read, and it was hard to set the book aside when I was forced to. 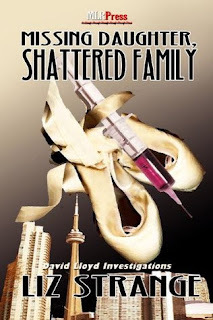 Missing Daughter, Shattered Family by Liz Strange ~ Missing Daughter, Shattered Family was refreshing in its old school detective approach, and I was especially taken with David, the main character. The main mystery was never overshadowed by the side story of David's past, but it really brings to light certain aspects of David's character. As he works on his latest case, he comes face to face with the police officer who got him kicked off the force. Beaten severely, resulting in a knee injury and hearing loss, as a result of being gay, David had no choice but to step down from his position on the police force. 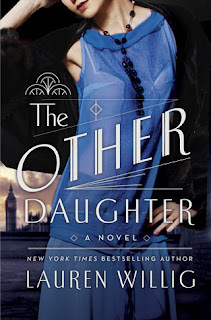 The Other Daughter by Lauren Willig ~ This was such a delight to read, a historical novel set in jazz era London. The Other Daughter has the feel of being a light read and yet it tackles some rather heavy issues. There are comic moments and rather tearful ones. There is plenty of drama and a bit of romance with a hint of mystery. Have you read any of these? What daughter-in-the-title books have you read? Rissi - I really enjoyed The Other Daughter and hope you do too if you decide to read it! Thanks for stopping by, Rissi! Melody - Oh, yes, "girl" is very popular. I made a rather long list back in the spring of all the titles I own with "girl" in the title. "Wife" is another one that is popular as well, although I have fewer of those books. Thanks for stopping by! Chrissi - It's a good one! Thanks for visiting! That's fun, all titles with Daughter in them. I haven't heard of the books you listed, but they do sound very interesting. Especially 'The Ninja's daughter'. Nina - The Ninja Daughter was good! I have another book in the series sitting on my shelf to read. One of these days . . . Thanks so much for visiting! Simant - Thank you! It was fun to put together. :-) Thanks for stopping by! Great spin on this week's topic. I haven't read any of these either so I'm going to have to check them out. I think I may have The Memory Keeper's Daughter buried in my TBR somewhere. Suzanne - Some of these I read years ago. It was fun to look back on them. :-) I hope you enjoy The Memory Keeper's Daughter if you decide to read it! Thanks for visiting! Someone else mentioned Daughter/Wife being used in a lot of titles. Another would be Daughter of Smoke and Bone - in terms of one I've read. I've also read, from your list, Cinderella Ate My Daughter. Lauren - I haven't yet read Daughter of Smoke and Bone, so it didn't make my list, but I do have a copy on my TBR pile. :-) Thanks for visiting! The Strange Case of the Alchemist's Daughter by Theodora Goss was fun. Dear Daughter by Elizabeth Little and The Murderer's Daughter by Jonathan Kellerman were both good. :) Fun post! Jenclair - If I'd made a list of my TBR books with "daughter" in the title, The Murderer's Daughter would have been on it. I have a number of those still to get to. So many "daughter" books! :-) Thanks for visiting! That's a lot of 'daughter' books! Jeane - You should see the ones on my TBR pile I have yet to read! LOL Thanks for stopping by, Jeane. The only one I've read is The Memory Keeper's Daughter and that was in my pre-blogging days. I'm noticing "Girl" in the title a lot these days. Kathy - Yes, "Girl" is very popular. I listed a bunch back in the spring for a top ten post. Way more than 10. Haha! Thanks for stopping by. Wow, I love that you found so many daughter titles. How unique. I think the only one I can think of is The Good Daughter by Karin Slaughter. Barb - I haven't read that one by Karin Slaughter, but it would be a great addition to the list! Thanks for visiting, Barb! You never realize how common a word or theme is until someone points it out to you. Love the list though! Astibe - My husband is very good at noticing common themes or words. :-) Thanks for visiting! The Ninja's Daughter sure looks creepy! Lisa - The cover makes it look creepy, doesn't it? It's not very creepy though. :-) Thanks for visiting! Haha, there sure are a lot of Daughter books :) I can only think of one I read at the moment, which is Daughter of Smoke and Bone, but I'm sure there are tons more. Lindsey - Yes, there are. I could probably have made an entirely different list or two with my unread "daughter" books. :-) I have Daughter of Smoke and Bone in my TBR pile. Thanks for stopping by! It's quite funny, I was trying to avoid Daughter titles this week as it's so common in fantasy! Jo - I was thinking about how common "daughter" is in fantasy titles, but most of the books in my TBR collection with that word in the title are historical fiction. "Moon" is also very popular, I've discovered . . . Thanks for visiting! Fun theme for this week! Captivated Reader - Thank you! It was fun to put together. :-) Thanks for stopping by! Lark - Thank you! I really liked both The Other Daughter and The Baker's Daughter. I hope you get a chance to read them! Wendy, these sound so intriguing! You certainly made me curious and the "Cinderella" book sounds like an important one, actually. Do you have any idea what the actual count is on books you've read? Donna Marie - Thank you! I have a running log of all of the books I have read dating back to the fall of 2003. With the exception of children's books I've read with my daughter. I only started tracking those this year--and even then I'm not great about logging them like I want to be. I keep a spreadsheet and also log all my read books on Goodreads. Katie - Thank you! Thanks for stopping by! Ellen - It was fun to put together. :-) Thanks for visiting! There are way too many “daughter” books, especially in the fantasy genre. It gets confusing! AJ - It does get confusing with so many similar titles. Historical fiction has a good number of them too. Thanks for stopping by! There are a lot of books with daughter in the title. Maybe not as many as girl. I have only read The Memory Keeper's Daughter from this list. Carole - No, not as many as girl, but enough to be noticeable. :-) Thanks for visiting! I read The Memory Keeper's Daughter a long time ago - that was a good one! Too funny about your husband's comment - "not another daughter book!"... I was looking at my list of books read this year and yikes, do I have a large amount of books with "girl" in the title. Iliana - Most of these titles are books I read years ago. It was fun revisiting them. :-) "Girl" is such a common word in titles these days . . . Thank you for visiting! LOL now you have me wondering what word reappears in my titles! I need to go check out Goodreads. This did remind me how much I loved The Other Daughter! I still dream about the MC's wardrobe! Katherine - It's kind of fun to look for recurring patterns in titles! I still think of her wardrobe too, so you aren't alone. :-) Thanks for visiting! Lauren - Written in Red is the best. I enjoyed her Black Jewel's trilogy, but not as much as the Others. Thanks for stopping by! Daughter really is a popular word in titles! I think "girls" is another word that is overused. Lisa - "Girls" is way overused, I think. Thanks for visiting! What an eye opener!! I had not realized how many books had the word "daughter" in the title! Interesting collection! I'm bookmarking this page, so that I can come back and look up these titles on Goodreads. Thanks so much for sharing!! Maria - "Daughter" is evidently a popular word for titles. "Wife" is too, I find. :-) I hope you like any of these you decide to read! Thanks for stopping by, Maria! I hope you are enjoying your week!